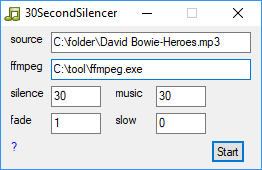 30SecondSilencer is a windows tool to add 30 seconds of silence every 30 seconds to an mp3 file. The duration of the silence and music segments can be customized. For example, you can add 10s silence every 55s in the mp3 file.